After posting the channeled message from my Council of 12 What Lightworkers need to know about the death of Osama bin Laden, I’ve been asked by several people to explain what channeling is. Psychic Communication: During psychic communication, the entity that is communicating with the psychic is “outside” the person. For example, I might be connecting with someone’s Aunt Sally who has passed. Aunt Sally may convey information to me in the form of visual images (clairvoyance), sounds (clairaudience), body sensations (clairsentience), emotions (empathy), or thoughts (claircognizance). For example, she might give me the visual image of pink light surrounding my client, which is my symbol for love. Channeling: This is the act of allowing a spiritual entity to “join” with your body and use your vocal cords and body to communicate with those on the Earth plane. (This is also referred to as voice channeling. When messages are conveyed in written form, it’s called automatic writing.) Therefore, when channeling my client’s aunt, I would allow my soul to “step out of the way” and allow the soul of Aunt Sally to join with my body and convey messages directly to the client. Consequently, rather than seeing pink light surrounding the client, I would actually feel the love Aunt Sally has for my client. Trance Channeling: The most famous trance channeler is probably Edgar Cayce. In order to connect with an entity, trance channelers need to be in a deep trance state. Because of this, (a) they usually must be lying down because they lose all muscle tone and (b) they usually are unable to remember what they have said or done. Therefore, someone has to be present in order to convey to them what they did or said. Conscious Channeling: This is the form of channeling that I teach in my classes. Conscious channeling is done while being fully in control. You are fully aware of what is happening and you can stop the experience at any time. There are many adept conscious channelers at this time (e.g., Esther Hicks). Spirit has communicated to me that conscious channeling is now the norm because the veil is thinning between the worlds thereby allowing us easier access to the spiritual realms. There are some people who are what I call “natural channels.” These are people who channel or learn how to channel easily. In retrospect, there are usually signs that they are “natural channels.” For example, many have channeled at certain times in their lives but didn’t know that this is what was happening (e.g., saying something and being unsure where it came from). They may also have done automatic writing, which is a form of channeling in which only the hand or hands are used by Spirit to convey information. I believe that natural channels have very likely channeled in previous lifetimes. You need to determine if you are a trance channeler. If you are, then you should never channel alone. You need someone to be present to make sure you are safe and so they can record what you have said. When channeling, it is essential that you always start by telling your guides that you only want to communicate with “those of the Light.” You should also engage in whatever protective rituals that feel right to you. But until you know how to discern between messages from the Light and messages that are not from the Light, you should be careful channeling on your own. If you do happen to connect with something that is not “of the Light,” you need to firmly tell it to go away and tell your guides to take it away. Through the Law of Free Will, the entity (whether from the Light or not) must go away if you tell it to do so . . . and your guides must make sure this happens. 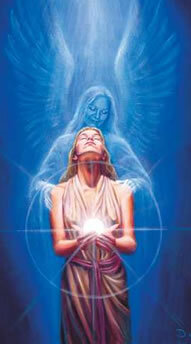 In later posts, I’ll explain many other aspects of channeling. If you are in the Southern California area and would like to witness channeling firsthand or would like to learn how to channel, please feel free to attend my Thursday evening Psychic Development, Mediumship, and Channeling class (always the 4th Thursday of the month). See my Calendar for upcoming dates. Finally, for much more information about channeling, please consider ordering my 14-page eBook Channeling 101.